Wild fresh-caught shrimp are better than farmed. Ask at your fish market and buy local shrimp. I usually get whatever is freshest and largest. In a large skillet over medium heat, sauté the garlic in the butter or olive oil until the garlic begins to sizzle. Add the parsley and shrimp and sauté until the shrimp turn opaque, about five to 10 minutes. Sprinkle with the salt, pepper, and red chile flakes, if desired. Serve on salad plates, garnished with lemon wedges. 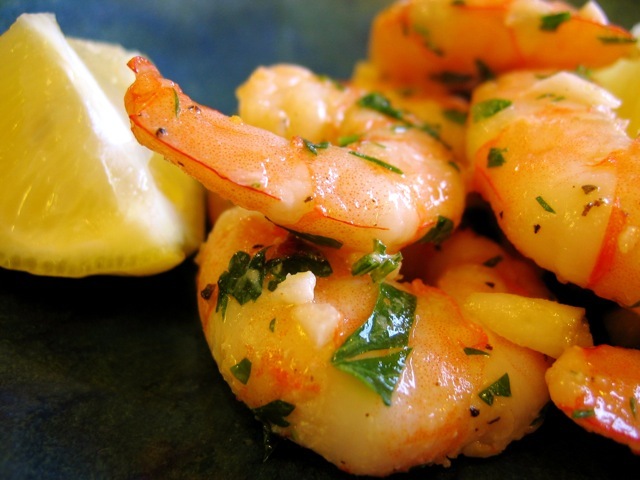 Culinate editor's notes: Some people like to add a splash of dry white wine to the shrimp as they sizzle. And to turn this appetizer into a main dish, boil a pound of pasta (preferably capellini, spaghetti, or linguine) and toss the pasta with the shrimp, adding more olive oil and butter as necessary. It's not traditional, but you may want to grate some fresh Parmesan over each serving. Read more about Italian Christmas Eve traditions in "The seven-fishes feast."